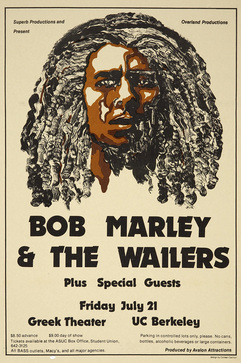 Bob Marley was not only the first reggae superstar, but the first superstar of the Third World. From "No Woman No Cry" to "Duppy Conqueror" to "Wake Up and Live," Bob Marley's songs continue to have universal appeal, reverberating throughout popular culture and consciousness. In the 37 years since his death in 1981 – at the age of 36 – his legend and stature have only grown. A familiarity and appreciation for Bob Marley can be the first step in crossing barriers of culture and communication, or a source of common ground. No matter where you may travel in Africa, Asia, Europe or the Americas, Bob Marley is known and loved throughout the world, and revered as a songwriting giant. From humble beginnnings in Kingston's Trenchtown neighborhood, Bob Marley and his peers came of age in the early 1960s in a brutal environment of crushing poverty, aggravated by an oppressive regime and inescapable class system. Fueled by calypso and rock steady rhythms, the Wailers came together with the help of Jamaican music legends like Joe Higgs, Leslie Kong and Clement "Sir Coxone" Dodd, and quickly grew into a formidable , competitive presence among Kingston bands. Combining the burgeoning Rastafarian movement in Jamaica, Pan-African politics, and U.S. and British music influences complimenting their own Jamaican sound, the Wailers helped develop what came to be the sound of modern reggae. In 1972, when Island Records president Chris Blackwell lost Jimmy Cliff – then reggae's only true international star, thanks to his starring role in The Harder They Come – to a rival record company, he was disappionted. "I was upset about that," said Blackwell in 2001, "because I knew the way to break Jimmy in was through the rebel character he played in the film." As Blackwell looked around for another reggae act with the kind of international appeal he envisioned for the genre, he came upon the Wailers, already hardened veterans with 10 years under their belt recording and touring in the Caribbean, with established chart success in Great Britain. "When the Wailers walked into the office," recalled Blackwell, "I knew – here was the real thing." Detailing despair, corruption and hardship utterly foreign to many of the band's fans, Bob Marley's lyrics poetically go for the political jugular in songs like "Babylon System," "Them Belly Full (But We Hungry)" or the shot-on-sight curfew nightmare of "Burning and Looting." While Marley's songwriting famously tackled spiritual matters and matters of the heart, he spoke forthrightly on the political strife in his native Jamaica, often putting himself in danger in the process. Marley survived an assassination attempt at his home in 1976, and later brought opposition political candidates together onstage in 1978 in the midst of a violent election season in a risky, yet transcendent act of hope. Shortly thereafter, Marley detailed the rise of Zimbabwe out of the oppression of Rhodesia, and continued to draw needed and necessary attention to the lingering repercussions of colonialism and slavery in the Third World. Grim realities gave birth to the music of Bob Marley and the Wailers, but despite the hardships and struggles he so expertly detailed and brought attention to, Marley's songs were also defiantly buoyant – sunny, danceable statements of hope. Few occasions in popular music have seen tougher lyrics married to such uplifting music.